Inside bets are also referred to as the number grid. These are bets that are found on a table and set the minimum and maximum bet amounts for example you may be required to make a minimum bet of $5. You opt to bet the $5 on one number or bet $1 each on a minimum 5 numbers. You will be surprised that there are some really interesting bets. The straight bet is also known as the classic bet. It requires more courage and you need to bet that the ball will land on a specific number. The pay out ratio is 35: 1 which makes it more popular. A bet of $10 will earn you a payout of $350 is you guess correctly. In this bet you place you chip on a border line between two numbers and if the ball falls on either number you win and are paid in the ratio of 17 to 1. If for instance you place your chip between 28 and 31 for a bet of $10 then you be paid $170 if the ball lands on either of the numbers. In this bet you are guessing that the roulette ball will settle in one of three given numbers and it comes with a payout ratio of 11 to 1. Also known as four number bet and requires the player to bet that the ball will rest on any of four selected numbers. It has a payoff of 8 to 1. 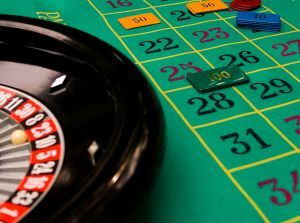 This bet is only available for the American Roulette and requires you bet on 5 numbers as the possible resting slots for the ball. It attracts a payout of 6 to 1. These bets are played outside the number grid for example you may bet on a red or a black. This type of bet earns you a payout in the ratio of 1:1 for instance if you bet $10 that the ball will land on a black you are paid $10 in addition to your bet. Like black and white bets, odd and even bets means you are betting on an either position and the payout is only 1 to 1. In either of these bets, you bet that the ball will rest either on numbers 19-36 or 1-18. If your bet comes true you earn a payout in the ratio of 1:1. For a better chance, tyr to play roulette online first.